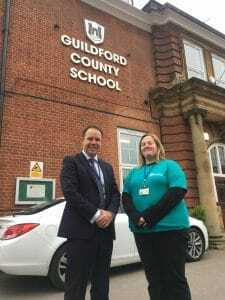 Jack Mayhew has been Head Teacher at Guildford County School since 2013 and recently led the school to an Outstanding OFSTED judgment. Recently, Misty Bower (CEO) met him to chat about the relationship between Matrix and the school. So Jack, what do you love most about being Head at Guildford County School? This is my 5th Year as Head, and I love that every day here is different – for me it’s more of a vocation than a job. I get to help young people make their lives better, become more content in themselves and work alongside them so they can find and fulfil their dreams. In your opinion, what are the biggest issues that young people are facing today? Firstly identity, being confident enough in however they decide to be themselves. There has also been a significant increase in stress placed on young people by society in the last 10 years, and it’s only getting worse. A lot of it is from Government targets, but it’s also around what I call the ‘commodification of life’, that is aiming for achievements in life based on the ‘commodities’ that society is selling, things that society tells parents their child needs to prove they’ve been a good parent. Young people pick up on these pressures. Lastly, many young people lack ‘wholeness’, by that I mean the ability to take a step back and consider themselves as a whole. Society seems to compartmentalise our lives, projecting unrealistic ideals for life and encouraging us to look for perfection in each individual area. So instead of looking at themselves at a whole and how they can get peace and contentment, young people tend to compare themselves negatively to these compartmentalised areas, such as sporting ability, appearance, money or whether they like their maths teacher! And what impact do you think these issues have on them? Without doubt, young people’s mental health is suffering. All the statistics point to it and sadly decline in funding has led to a reduction in appropriate services, leading to young people not getting the support and attention they need. GCS has worked with Matrix for many years now, what role does the Matrix Youth Team play in supporting your students through some of these issues? Matrix provides a multi-faceted role in school. Firstly providing a space for young people to talk about themselves – with that as their focus – that’s really important. Also, Matrix is able to build relationships with young people, without the label of ‘teacher’ – this allows support to be deeper. Young people need teachers and non-teachers in their lives to listen, talk to, discuss and question with. This is really important, and the Youth Work that Matrix do here is invaluable for this. There are less opportunities today for society to show that they accept you as you are and then do something for you alone, so for our students to connect with Matrix, as someone from outside the school system, that is choosing to be there with them, demonstrates that society more generally values them – this makes a BIG difference. Lastly, can you tell me how you would like to see the role of the Matrix Youth Team grow over the next few years? I’m very excited about the new provision that Matrix are offering this year and how we can go forward in developing this together – I think you guys are fantastic! Matrix provide an essential space that’s not school, but not parents, a safe space where they know there are people that will get alongside them and say it’s ok to feel upset, or worried and that’s all part of being a human being. As we go forward we want to ensure that structure and continuity remains as young people latch on to that and if you’re not there one day any relationships and progress made goes back several steps. We’d also love to find other ways we can work together – maybe even be things we haven’t thought about yet, things that we can explore together, that’s where I’d like to see it develop.